Last week, while driving east on Stadium Drive, I happened to notice something different at the shopping center next to Wayside West on Kalamazoo’s west side. A familiar pizza joint popped up in the place of a so-so one. This afternoon, Daddy Daycare got extended by a few hours. J had some errands to run that kept her out of the house pretty much all afternoon. On her way home around 4:00, she called and asked if I wanted to do pizza for dinner. She was already pretty close to home, so there was no need for her to delay. I said I’d take care of it. Our go-to when it comes to pizza is Cottage Inn. The online ordering makes it too easy and we really like the pizza. I think she was expecting me to just order from there, but I never pass up an opportunity to try out something new. This new pizza place should already be familiar to most in the Kalamazoo area. Jaspare’s Pizza and Fine Italian Food already has four successful stores in the area. 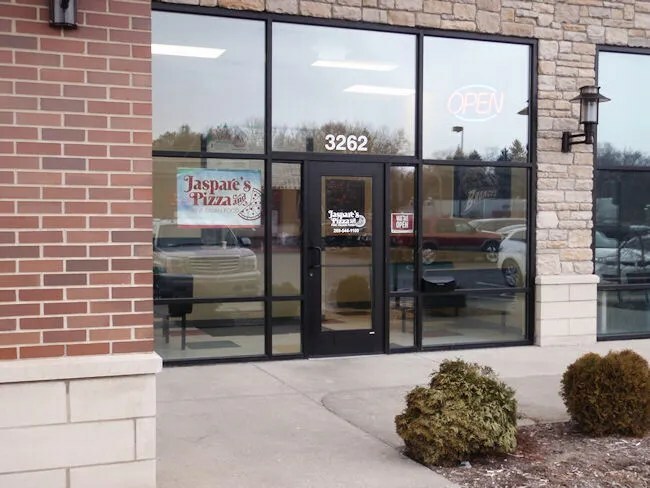 The newest Jaspare’s location is on Stadium Drive in Kalamazoo’s Knollwood Neighborhood. It’s in the same small store front that, until recently, was Gumby’s Pizza (or did they change their name to Goomba’s?). We have eaten at Jaspare’s in the past. The first time was the old Portage location on the corner of Sprinkle and Kilgore not long after we moved to Kalamazoo from Lansing. The most recent time, we ordered from the Gull Road location. 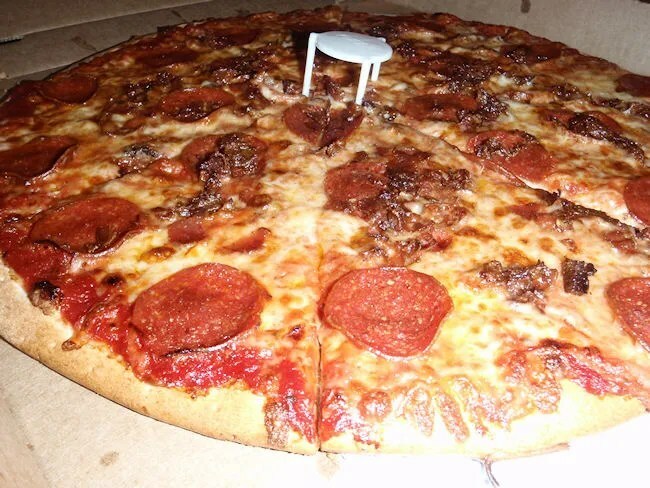 I decided to keep the order pretty simple and just order a 16″ thin crust pizza with bacon and pepperoni. 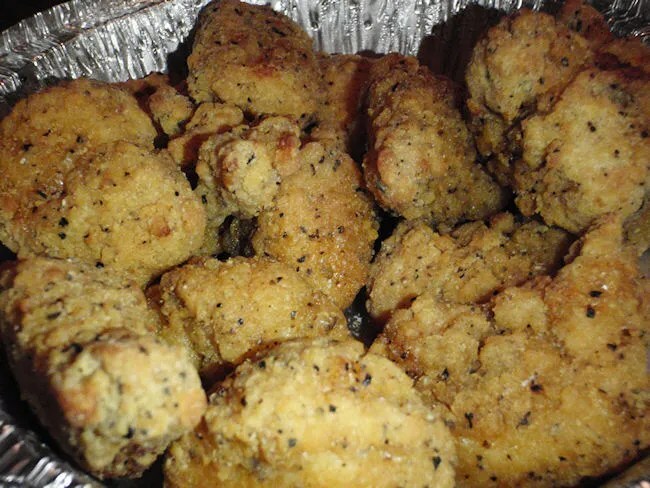 I also added on an order of Baked Boneless Chicken Bites. The guy on the other end told me it would take about 20 minutes which worked out perfectly. When J got home, I hopped in the car to make the short drive down Stadium. The restaurant is very small and I assume they do about 99% of their business as carry-out or delivery. There are two full size booths inside the very small waiting area so you could dine in if you wanted to. My pizza was just coming out of the oven when I got there. I settled up which cost me me right around $25. A few minutes later, I was handed the box with the pizza and a white paper bag with the chicken. 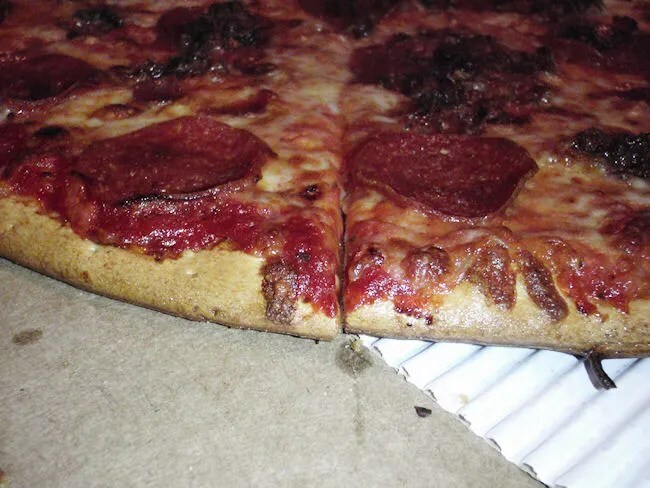 The thing I did different this time was order my pizza “well-done.” J and I really prefer pizza that has a crispy crust and a nice, golden brown layer of cheese. 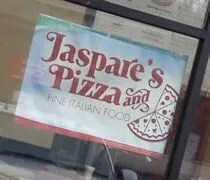 In the past, that’s kind of what has kept Jaspare’s pizzas from being really good. We’ve always enjoyed the food we’ve gotten from them, but it hasn’t really stuck out. This time, just by asking for them to keep the pizza in a few minutes longer, we ended up with a pizza that we were much happier with and really enjoyed. The handle of the crust had a nice snap to it and the meat was all nice and crispy. The thin crust pizza, which is cut in triangles, had a very New-York like quality to it. It was sort of crispy yet still soft and chewy. The Baked Boneless Chicken Bites were surprisingly good. I say surprisingly because we just went with the plain chicken instead of ordering with a sauce. Our intention was to give them to L, but after taking a bite, we both kept stealing them for ourselves. They were large chunks of breast meat with a very crispy and somewhat spicy breading. All three of us really enjoyed them. I think we found our combination for ordering at Jaspare’s. All pizza places take some trial and error when trying to find that perfect combination. We were both much happier with the pizza this time by asking for it well done. If they ever get their online ordering up, they could take a run at Cottage Inn as our go-to pizza place. I didn’t have any idea that Goomba’s vacated that space. Part of the appeal of that place was that it was open until 4 am to cater to the after-bar crowd. I presume Jaspare’s won’t do that. You’ve probably noticed, but Grubhub, eatstreet.com, et al have them up for online ordering now. Doesn’t seem to be open late at all, but there’s several others filling that market now. Still more 3 AM choices than most cities. Please visit http://www.jasparespizzastadiumdr.com for FREE Online ordering!